It’s one of the most iconic city’s in the world for its bustling streets, exciting culture and dozens of famous attractions and landmarks. 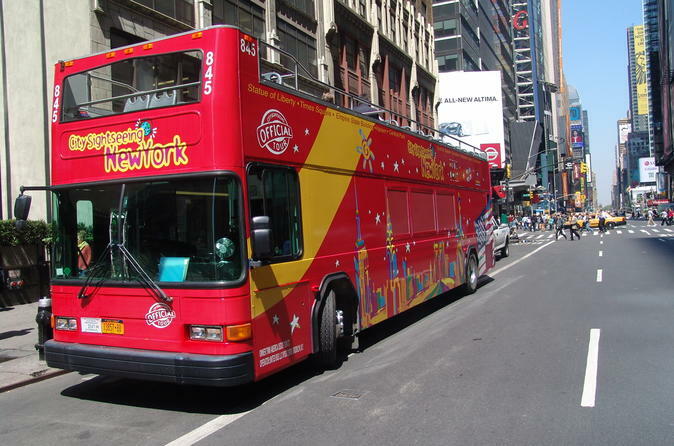 With a choice of 3 loops – Uptown, Downtown & Brooklyn - with over 40 hop on hop off tour stops in total, City Sightseeing New York is the perfect way to explore The Big Apple to your hearts content! Along the routes, passengers will enjoy panoramic views from our open-top double-decker buses of some of New York’s most amazing sights including Central Park, Times Square, Empire State Building, Top of the Rock, Rockefeller Centre and the 9/11 Museum. With 48-hour and 72-hour ‘All Around Town Tour’ tickets, passengers will also receive several fabulous inclusions, such as a FREE night tour and hop on hop off ferry tour. Enjoy panoramic views of New York’s skyline lit-up during the evening, and get close-up to the iconic Statue of Liberty on the ferry tour. With flexible ticket options, amazing inclusions and panoramic views from our open-top double-decker buses, City Sightseeing New York is the perfect way to explore. Choose between a 24-hour Uptown, Downtown or Brooklyn Tour ticket, or if you’d like to explore all the routes, opt for a 48-hour or 72-hour All Around Town Tour ticket. With the All Around Town Tour ticket’s customers will benefit from wonderful inclusions (please see Inclusions). As the tour travels to the biggest and best sights in New York, passengers can also enjoy the on-board audio commentary, informing passengers on the city’s most fun and interesting facts. The commentary is accessible in several languages. Sit back and relax as the tour takes you on a remarkable journey around NYC! Times Square North - Corner of 57th St & 7th Ave. Empire State Building 1 - 34th St between 5th & 6th Ave. Empire State Building 2 - 32nd St & 5th Ave.
Flatiron District - 22nd St & 5th Ave.
Central Park - South between 5th & 6th Ave.
*(Not a hop on hop off service).